Find a Reader/Make your Own! QR Codes: What are they good for? Receive email alerts whenever guides of interest to you are published. Chat, text, phone, e-mail, telepathy -- we are here to answer your questions. Renew books online, view records, etc. If we don't have it, we can get it. Free service for CofC community. PDF brochure outlining facilities and services. Image by Project Stickermap via Flickr. Make sure your phone can scan a QR code with its camera, either with an application that you download or via software that's already installed on your phone. Your mobile cameraphone may be able to scan QR codes out of the box or you may need to download software. When you see a QR code, use your phone's application to scan it. You will be taken instantly to information on your phone. QR codes at Bath provides the following scenarios of how QR codes might be used in an educational context. QR Codes Going Slightly More Mainstream? 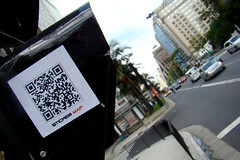 HighEdWebTech provides an interesting discussion on whether or not QR Codes are becoming more mainstream in the US. A great example is Google's Favorite Places program. Google is mailing window decals to 50,000 businesses around the US. These decals include a QR code that can be scanned with a smartphone to directly view the mobile Place Page for the business to learn more about their offerings. Jolanda-Pieta (Joey) van Arnhem M.F.A., M.L.I.S.